These tips are designed to help you keep a person living with dementia happy. How do you keep an Alzheimer's patient happy? As many of you know, I was always looking for ways to keep Dotty happy. How to keep her "more there". They really go hand in hand. I struggled with this problem for a long time. This was especially true during those two long years before we learned Dotty was suffering from hypothyroidism. I already wrote about how I finally decided that Dotty and I would start living our life the way we always had. Once I made that decision the answer to the question above was easy to discover. Do things that the person living with Alzheimer's always enjoyed doing. Yes, there are some constraints but they really shouldn't be viewed as obstacles that cannot be overcome. All it takes is a little creativity. 1. Take a ride in the car. Dotty liked to ride in the car. On every ride Dotty might remark about how big the trees were. We have some huge banyan trees here in Delray Beach. We also have big beautiful clouds. Sometimes Dotty looked at a cloud and said, it looks like a dog. Actually, all the clouds looked like a dog to her now that I think about it. Every time. There was a time when Dotty would constantly say the same thing about the trees every time we drove by them. The same thing over and over - repetition. Now, just the thought of those experiences makes me feel happy. Dotty was continually amazed and fascinated by those big trees. Was that a bad thing? No. In fact I realized how really wonderful it was. Every time Dotty saw those trees it was a brand new experience for her. Like the first time she had seen them. We started driving down the street with the "big" trees every day. The ride made Dotty happy; and in turn, it made me happy. Do you take rides in the car? 2. Go for a visit. Dotty really enjoyed visiting people. This did enliven her. It didn't hurt that the people we visited were always giving Dotty food -- mostly cake and candy. Getting out is not only important for the person living with Alzheimer's, it is important for the well being of the caregiver. Get out of the house. 3. Go look at the dogs. Do you have a dog run near your home? If so, you don't need a dog to go to the dog run and watch the dogs running around and playing. A visit to the dogs often cheered Dotty up, and I used it sometimes to bring her out of a funk and get her around people and into bright light. Dotty was always fascinated when she saw the dogs. They really amazed her. Is that a good or a bad thing? Do you have a favorite place you visit? Dotty really enjoyed music and it enlivened her. And listening to here sing really made my heart soar. Did you know that Dotty only started singing after her dementia diagnosis? We were lucky, we have the music channels on our cable television. This allowed me to play songs from the 30s, 40s and 50s. Sometimes Dotty would start singing some of the words from some way old song that I had never heard. Not only did this make me feel happy, it fascinated me. More importantly, it was a good reminder that there was a lot more in there than you might sometimes think. We reached the point where all I have to do was sing the first few words of an old song that was familiar to Dotty and she would start singing. This is one of the ways I learned that it is always a good idea to be a guide. Do you sing along with the Alzheimer's patient? Or, lead them in song? Games and mental exercises are good for persons living with Alzheimer's disease. Jigsaw puzzles, crossword puzzles, and games they use to enjoy playing over the course of their lives are excellent. For Dotty the single best approach was the toy parrot we named Harvey. See - The Best Alzheimer's Caregiver Tool of Them All, Harvey. Dotty also loved to play with coins. In the beginning it bothered me when Dotty would constantly play with her change. Later on I realized not only did it entertain her, it allowed her to use her eyes, brain and hands in combination. It was at that point that I realized that this was in fact a good exercise for a person living with dementia. This was by far Dotty's favorite. First, she loved food. Second, she loves being around people. I wrote an article -- Alzheimer's Caregiver Lament -- I can't take her out because she eats with her hands about this issue that you might find of interest. It is easy to come up with excuses not to do, or let, someone living with Alzheimer's do things. In the article, I discuss the easy solution to a common problem -- eating with the hands instead of utensils. Eat finger foods. Burgers, chicken, wings, fries, whatever. The real reason some Alzheimer's caregivers won't take persons living with Alzheimer's out is because they are embarrassed by them. Try to get over it. Not only will the person living with dementia act better if you take them out, you'll feel better. Way better. Some of you might be finding that when you want to do something the Alzheimer's patient says NO. No, I don't want to go out. No, I don't want to do that. The word "NO" is pretty common when it comes to someone living with Alzheimer's or a related dementia. You might allow this to distress you. You shouldn't. Start accepting that some Alzheimer's patients live in the world of "No". I reached the point when my mother would say NO, I just laughed. Not at her. Not in any mean spirited way. More like, here we go again. The word NO is part of our life. I accept this to be true. Accept. I learned when Dotty would say NO, I just start moving her along as I explained how much fun she was going to have, or how she was going to benefit. I start moving her along as if she said Yes. I start talking and explaining. Dotty starts to cooperate most of the time. I learned NO doesn't me no the way we usually use and understand the word. Accept Alzheimer's and make it work for you. All of tips above are simple things you can do to create happiness inside Alzheimer's World. There are ways to help keep a person living with Alzheimer's happy and active. You need to discover what works best for you. At the end of the day, if you stay active and engaged both the patient and the caregiver will benefit. Not only will you be happier, the joy of seeing your loved one operating and functioning will fill your heart with joy. Good day, not bad day. Bob DeMarco is the Founder of the Alzheimer's Reading Room and an Alzheimer's caregiver. The ARR contains more than 5,000 articles Bob resides in Delray Beach, FL. Dementia care is the art of looking after and providing for the needs of a person living with Alzheimer's disease or a related dementia. 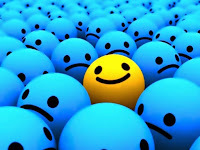 Happiness is a mental or emotional state of well being defined by positive emotions ranging from contentment to joy. Happy mental states also reflect judgement by a person about their overall well being. Purpose the reason for which something is done or for which something exists. Having as one's intention or objective. Caregiver is a person who gives help and protection to someone who is sick or in need.